Restoration Fund using your credit card. To help contribute to the GHS's many ongoing restoration projects, Dino's Market and the three IGA Markets in Pascoag, Slatersville, and Scituate have agreed to donate 1% of totals on receipts turned in for merchandise purchased at their stores. Turn in your receipts to any GHS Member, bring them with you to our next meeting, or drop them off at Glocester-Manton Library or the Job Armstrong Store. "Reuben Mason House Will Be Saved"
"Fight to save the Reuben Mason House"
"Help is on the way - Grant boosts Heritage Society effort to save Reuben Mason House"
The Glocester Heritage Society has embarked on a momentous voyage: the restoration of the 2 1/2 story colonial Dr. Reuben Mason House on Putnam Pike at Acote's Hill. It is historically significant to Glocester as well as the State of Rhode Island, and is considered a "key gateway" structure for the village of Chepachet. Our goal is to create a Dorr Rebellion Museum and a second-floor caretaker apartment. On December 16, 2008 our Pettingill/Mason House three-member Steering Committee met with Newport Collaborative's architect and museum consultants from Youngken Associates in Job Armstrong's upstairs Reading Room. The main topics were restoration and use of the building's interior. The congenial exchange of views reassures us of a pleasant working relationship. The work of the Steering Committee is sometimes tedious and often fascinating. Agenda items have included acquiring signage and insurance; defining what is and is not an exterior repair so as to meet the specifications of the Champlin Foundation's grant; security for the building; requests for proposals for Phase 1 work; collaborating with Roberta Randall of the RI Historical Preservation and Heritage Commission; uncovering architectural details; and informing the public. It is impossible to know the exact age of the Dr. Reuben Mason House, at the foot of Acotes Hill in Chepachet. We do know the homestead was sold in 1756 by Joseph Pettingell to his son, John, and sold again in 1765 to Richard Bartlett, who lived in the house until 1774. We presume that much of his medical practice took place in the home, of which much recent notoriety falls, where he resided with his wife and three children – sons, James (also a physician) and Stephen, and daughters, Dorcas and Sophia. Dr. Mason always referred to his residence as his "mansion house." For the times, it was indeed a large and especially comfortable home, so the designation of "mansion" may not have been at all exaggerated. Upon its restoration, the house will be used by the Glocester Heritage Society as a museum to commemorate the Dorr Rebellion – the forerunner of the enfranchisement movement that has made America the model of a representative democracy for the world. 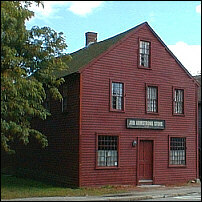 The building is a two-story gable end house typical of the colonial style of the mid-18th century. The structure is two rooms deep by three rooms in length and contains a central chimney. A one and one-half story ell addition is attached to the east end of the building. The building construction consists of a heavy timber frame (post and beam) structure founded on a stone masonry foundation with a full basement. The frame is comprised of hand-hewn timbers providing the support for the walls, floors and roof as well as forming the building shape. The center of the house contains a large stone and brick masonry chimney extending from the basement floor out above the roof ridge. Evidence of four fireplaces exists in the main building. The exterior and interior wall framing is comprised of wood studs, which are non-load bearing. The exterior walls were sheathed with wood planks and covered with wood clapboard siding while the interior walls were finished with plaster placed over wood accordion lathing nailed to the wall studs. The house contains a front entry stairway and a second stairway in the rear of the ell addition. Typical of central-chimney homes and the period, both stairways are narrow with steep risers. The original floor construction consists of wide plank wood floorboards. The proposed rehabilitation of the house will include the restoration of the building exterior, the building interior, the structural framing system as well as updating the mechanical systems. The project objective provides for the preservation of an early building in Chepachet and includes the conversion of the residential dwelling into a museum commemorating the Dorr Rebellion. A caretakers quarters will be established on the premises. The Glocester Heritage Society has secured a 99 year lease to the Reuben Mason House and is embarking on a total renovation of the property. A preliminary assessment by The Newport Collaborative estimates the cost of restoration at approximately $350,000. Following restoration, the Society will use the house for a Dorr Rebellion Museum, commemorating the effort by Thomas Dorr to extend the right to vote to every free man in Rhode Island, whether or not they owned property. At the time of Dorr's campaign, voting in the State was limited to persons owning real estate valued at $300 or more, which was equivalent to $100 ,000 or more in today's dollars. At that time, the Governor of Rhode Island was elected according to the original colonial charter from the 1600's and voting was limited to the wealthy. Dorr and his supporters actually held a constitutional convention to pass a new constitution for Rhode Island with expanded voting rights. An election was then held and Dorr was elected Governor. So Rhode Island is the only State to have had TWO elected governors at one time. The recognized Governor called upon Washington to help put a stop to this uprising and federal troops were dispatched to quell the insurrection. As the federals marched up what is now Route 44 from Greenville, Dorr and his supporters assembled atop Acote's Hill. The commander of the federal troops had designated The Reuben Mason House to be a field hospital for the battle that was expected to ensue. Dorr, however, was a pacifist and urged his supporters to disband before the troops arrived, which they did. He himself fled to Connecticut but later returned to Rhode Island, was arrested and actually died in prison in Providence, a convicted felon. The earliest record of the Reuben Mason House is a deed of sale from 1765. It is an unusually large and well built house for the era and is representative of the significant role Chepachet has played in the economic life of Rhode Island since colonial times. The renovation is expected to take a minimum of two years to complete with another year allocated to creating the museum. At present, just the cost of insuring the building is in excess of $9,000 per year, so grants and assistance from concerned citizens via donations is critical to completing the process. Information about the progress of the restoration is available here on our website and in brochures available in front of the house itself. Anyone interested in further information about the Reuben Mason House may contact Harry Anderson at 401-934-0511. This is the largest project ever undertaken by the Glocester Heritage Society and we will need the support of the entire community to be successful in this venture. Please let us know what you are willing to do to assist us in preserving the heritage that makes Glocester unique in Rhode Island. On December 20, Edna Kent, John Doucette, Frank Stevenson, and I took a look at the Dr. Reuben Mason House. After poking around on the first and second floors, up in the attic and down in the basement, Frank Stevenson summed up the feelings for the entourage when he said, "It's really not as bad as I had feared." And, in fact, for a building that has been around for over 200 years, it is in remarkably good condition. It has not suffered wholesale changes to its fundamental look. Many original doors and floors remain intact. And much of the original molding and woodwork remain unscathed, save for multiple coats of paint. An inspection of the basement did reveal a number of floor joists and beams that suffer from dry rot, and much work will need to be done to address these structural issues. Yet the foundation and the center chimney are in good repair, for the most part, so major foundation repair will not be necessary. All in all, the first inspection left us feeling optimistic. For once, things are not as bad as they could be. But, the house is at a point where further deterioration could happen quickly. We are fortunate to be able to address the existing issues now, before they become major defects. The Champlin Foundation has funded initial renovations to the exterior of the Dr. Reuben Mason House. The Champlin Foundations make direct grants for capital needs to tax exempt organizations, substantially all in Rhode Island. Typical capital needs are the purchase of equipment, construction, renovations, and purchases of real property. What criteria did GHS meet that so many others do not? They expected us to have a reasonable "track" record, which in most cases required a minimum of three years operations. GHS was incorporated in 1967. Champlin examines other funding sources, operating funds available and many other factors. Our commitment to seek additional funding from members and other grant sources was crucial in their decision-making. We needed to describe our fund raising plans, and it was helpful that we had other positive fund raising results in the past, such as the Evans Schoolhouse and the Job Armstrong Store. We needed to articulate what we would do if our fund raising is not totally successful — what parts of the project we will proceed with and their cost . We knew from preliminary studies that the exterior had to be the first concern, and subsequent plans for interior renovations to create the Dorr Rebellion Museum must be secondary. We were also able to provide evidence that we would be able to pay for increased operating costs. GHS has a solid record of meeting budgets and projected cost increases. All in all, the GHS has proven it is a viable community organization that sets and meets goals. Congratulations to our resident grant-writer, Harry Anderson, for his diligence on this newest and most ambitious GHS project yet.